Miniature layer cakes dipped in chocolate are a grown-up alternative to those foil-covered eggs. 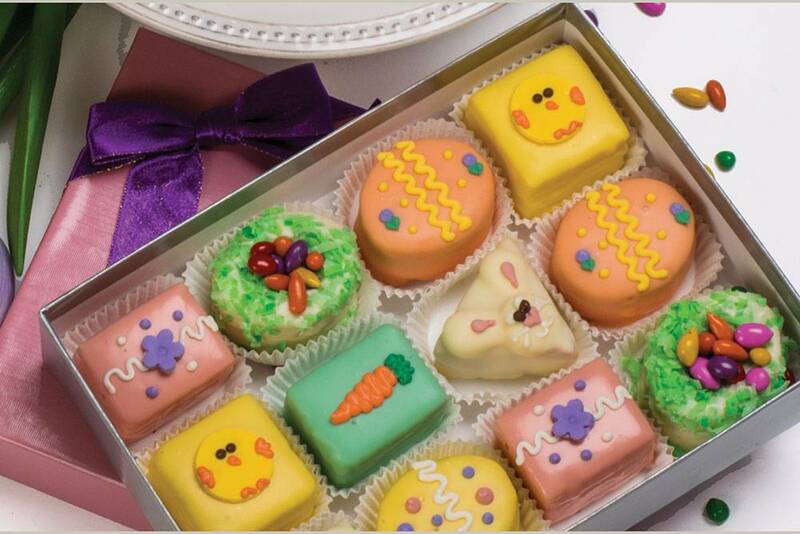 Petit fours are delicious bite-sized treats perfect for parties and birthday gifts. 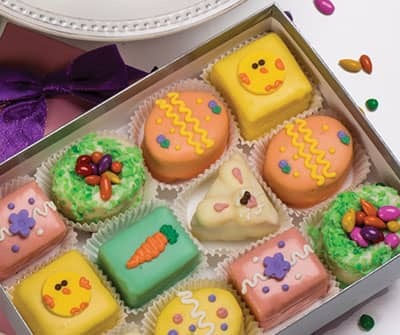 Each bite of these delightful petits fours will bring to mind the joys of spring. We created this whimsical assortment of Lop Eared Rabbits, Pineapple Creme Chicks, Hummingbird Nests, Strawberry, Truffle and Lemon Eggs, and Milk Chocolate Carrots petits fours to delight all. Freshly flavored with lemon, strawberry, raspberry, orange, pineapple, and scrumptious milk and bittersweet chocolate, no celebration could be complete without these multi-layered, bite-sized confections. "Petit Four" means "small oven" in French. Though the idea of these tiny cakes being baked in miniature ovens is adorable, the real meaning comes from the heat the ovens of the times used - the high heat of the "grand four" and the residual heat of the "petit fours". The lower heat, cooling phase old ovens went through was perfect for baking mouth-watering tiny pastries, and thus, petit fours were born.